The owner of a Nebraska ranch turned over nineteen llamas, twelve cats, and a puppy to the Humane Society last week after acknowledging that she was no longer able to care for the animals. Fourteen llamas were pregnant. 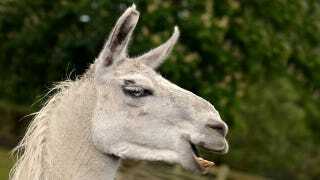 The llamas will be sent to sanctuaries in Colorado and Illinois, but questions remain about the five non-pregnant ones. Were they putting off child-bearing in favor of career? Were they just waiting for the right guy? Clearly, these llamas need to settle down before it's too late.